Much as large computing projects can make use of your free CPU cycles, Symform leverages your free hard drive space and that of others into a secure, encrypted online storage service. Quite clever actually, and even better--it's free (except, of course, for the electricity and storage space you contribute). You can be a leech and simply use the 10GB of free storage offered, but up to 100GB of online storage is available if you contribute. You can up that to 200GB by referring friends. Symform's configuration wizard is modern-looking, well thought out, and easy to use. Setting up Symform is easy. Basically you tell it what you want to store in shared space, how much space you're willing to contribute (nothing, or 10GB to 150GB), and how much bandwidth to use. You can also define when transfers are to occur. One caveat: You need a relatively fast connection--64KBps upstream and 125KBps downstream. This is well within the capabilities of the average DSL or cable connection. Unlike many online storage programs, there's no system tray app to remind you that Symform is running. It simply starts three services and stays out of the way. If you want to change settings, or see the status of your backup you simply run the setup program again. What's not quite as easy to understand, perhaps, is that Symform is a synchronization program in its purest form. After you've set up relationship between a local and online folder to synchronize, the folders are truly and automatically synchronized. Local folders are locked, so you can't delete them from within Windows though you can delete files with them. If you get smart and rename or delete the folder using a boot disk, then it will be restored automatically next time you boot normally. Syncing continues until you remove the mapping, or uninstall the program. Another feature of Symform is hot restore. Basically, this is a local backup that you can restore from more quickly than from online. There's also a turbo seeding feature in which you encrypt the files to a local disk, then upload them. This allows faster uploads and less CPU usage during the upload. You may also sync multiple PCs using the same account. Obviously, Symform is relying somewhat on its users to be responsible and polite. However, data is replicated in many different locations so that it should always be available when you need it. In my limited testing, it found my data every time. Each folder being synced will have sync information placed in it, though it's in a hidden folder. One place I believe Symform will make great inroads is in NAS. QNAP has already added Symform to its backup capabilities and other vendors are likely to follow. NAS boxes are largely hands-off, frequently have capacity to spare, and are generally available 24/7--the perfect storm for peer-to-peer backup. 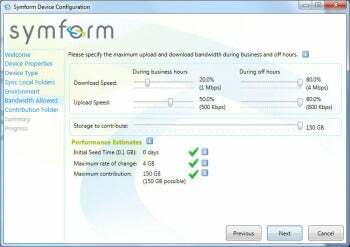 With mainstream online backup vendors' free options beginning to fade from the scene, Symform is a great service to have around. It's easy to install, easy to use, and allows you to give something back. I see no downside whatsoever. Use it. Back up your data with this free and barter-based (your hard drive space for theirs) online, peer-to-peer storage service.